Recently, the Democratic Party officially adopted a $15 minimum wage as part of its platform. 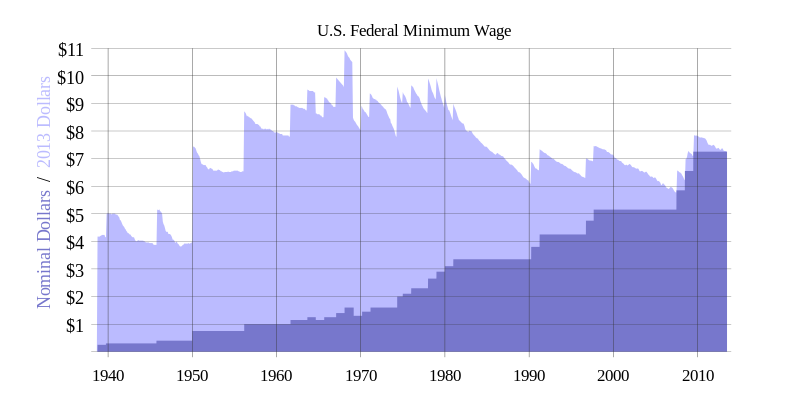 While this discussion about the increase in minimum wage has been going on for quite some time, the issue of exactly how much minimum wage should be has been, from what I’ve seen, hotly contested. The TL;DR here, in my humble opinion, is that “15” is a nice round number that’s easy to remember (which is likely why it was chosen) and when cost of living adjustments are factored in it’s only slightly (as in, less than a dollar) higher than what it should be. More on that in a little bit. There’s some math in this article. I try to keep it simple and visualize it where possible. If you are comfortable / familiar with what “adjusted for inflation” means you can probably skip this section. Understanding this concept is critical to understanding the larger issues of minimum wage and rent impacts. Have you ever heard the phrase “When I was a child, ____ only cost ___”? Over time, some prices seem like they go up (the “nominal pricing”) even though the impact on you spending ability (the “real pricing”) has remained the same or declined. For example, a dozen eggs cost (on average) $1.03 in 1980 and $2.75 in 2015. But in 1980, $1 had the same buying power as $2.88 does in 2015. If these seems confusing, think of it this way: If you worked at a factory from 1980 to 2015, were paid $10 an hour, and never got a raise, you’d earn $400 per week. 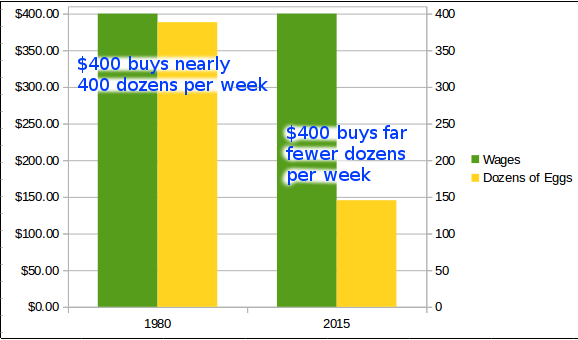 Back in 1980, this means you could buy 388.34 dozen eggs per week. But in 2015, that same $400 will only buy you 145.45 dozen eggs. You get fewer eggs for the same amount of money. How much would you need to earn per week to still afford 388.34 dozen eggs in 2015? $1,067.94 weekly. Or $26.70 per hour (at full-time). The crazy thing? 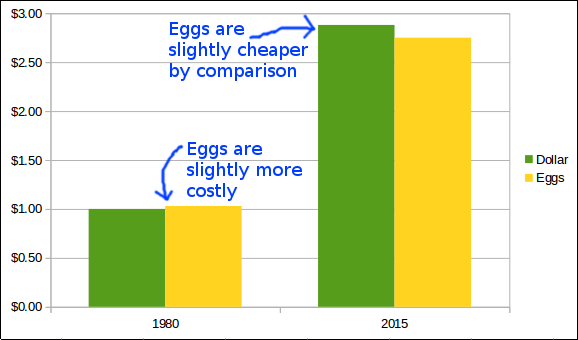 Despite that huge apparent increase in price, the cost of eggs (the amount that it impacts your purchasing power) has gone down. But what if the price of eggs had gone up instead, while wages continued to remain the same? It seems to me to be equally plain that no business which depends for existence on paying less than living wages to its workers has any right to continue in this country. By “business” I mean the whole of commerce as well as the whole of industry; by workers I mean all workers, the white collar class as well as the men in overalls; and by living wages I mean more than a bare subsistence level-I mean the wages of decent living. You may have seen parts of that quote before, in meme form. The minimum wage wasn’t officially instituted until 1938 (5 years after that quote), but his feelings about the intent behind what would ultimately become the minimum wage seem pretty clear. Regardless, the intent is irrelevant here. It’s a thing. It’s a number, and we can do math with numbers. The funny thing? America has been incredibly prosperous. 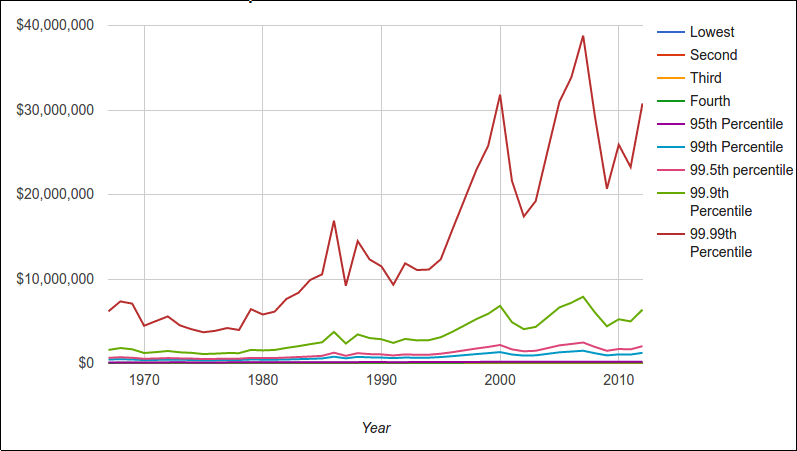 Our “Gross Domestic Product”, which is basically the number we use to see how successful our country is, economically, has risen pretty aggressively over the past century. As a country, we’re doing great! But what happens when you take the data of our Gross Domestic Product and compare it to the historical minimum wage? 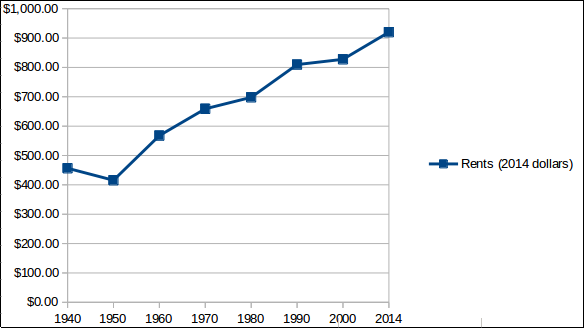 That chart is from a dataset I’ve been compiling (integrating data from BLS, and other publicly-reported data). Feel free to check it out. The red area shows the the growth of GDP over time (it gets bigger!) and the blue area shows how much of that GDP is paid out to workers (it gets smaller!). What this chart means is that, even though the US Economy has been doing better and better, the money that we’re earning, as a nation, is not being shared fairly with the laborers. By “fairly” I mean that, at the very least, that blue line should be a stagnant amount (eg. 20% across the board), so as GDP increases, so do wages (and vice versa!). In other words: the US economy can support paying its workers more. The money is available. 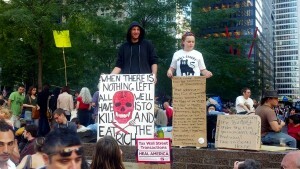 “Cost of Living” is a nebulous blanket term that includes shelter, heat, electricity, food; the basic human necessities. 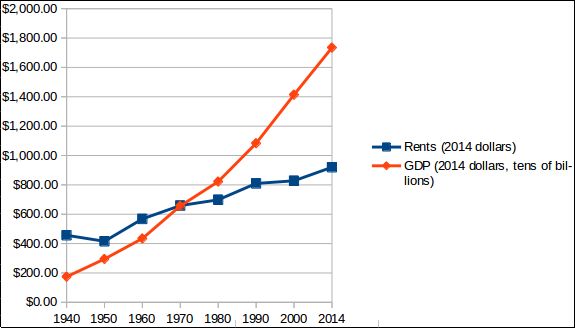 The most egregiously growing part of Cost of Living, or at least the one with the largest impacts on the most of us, would be shelter / rents. 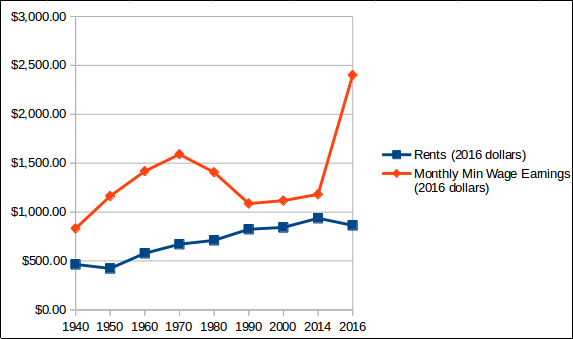 The US Census has a table of Historical Median Gross Rents, which considers both the rental costs as well as the estimated average cost of utilities (electricity, water, heat). It has both national and state averages for each decade from 1940 up until 2000. These were adjusted to year 2000 dollars. There is also the map of Median Monthly Gross Rent: 2010–2014, which is adjusted to year 2014 dollars. I combined the two datasets, adjusting the nominal values of the former to year 2014 dollars. 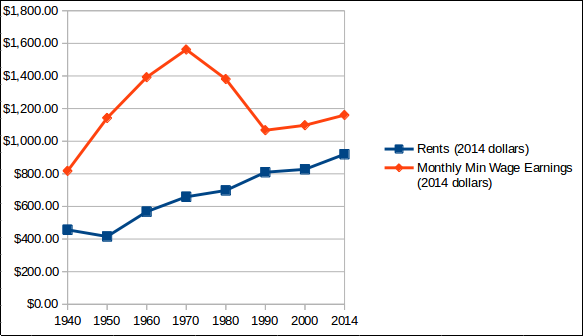 So rents are increasing. How does this look compared to the economic health of the country (the GDP, that we previously compared to the Minimum Wage)? 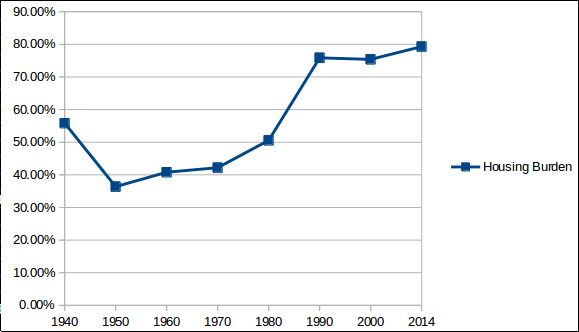 All values in 2014-adjusted dollars, source: US Census & US BEA, links above. 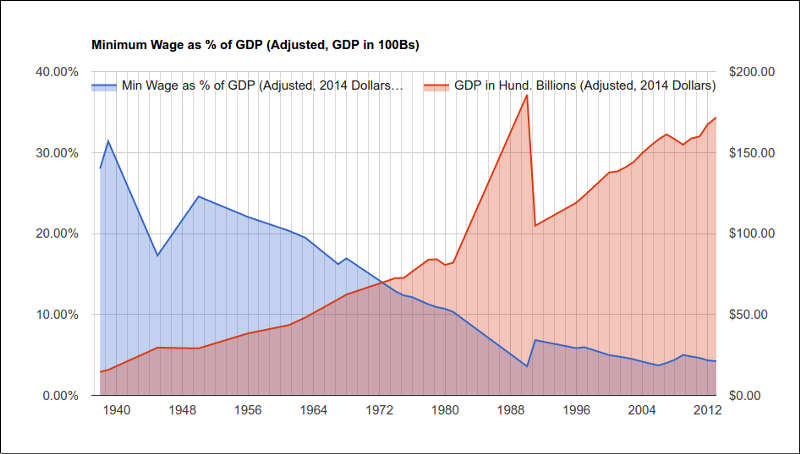 Note that GDP is in tens of billions, and has been scaled down to compare the trends. The pinch really started happening in 1990. In the years leading up to 1980, full-time minimum-wage earners could afford to pay for a median-priced dwelling (and their utilities!) while only being “moderately burdened”. But from 1980 to 1990, this scenario changed drastically, and has been relative stable since, leaving individuals and families with barely 20% of their income to be spent on things such as food, healthcare, clothing, and anything else. Given that the current minimum wage is a mere $7.25, asking for it to suddenly be more than doubled seems like a tall order! But given what we saw earlier about the decline in purchasing power of the current minimum wage, what does this look like when we make it an even $15? The $2,400 monthly income is, of course, pre-tax, but the income tax liability would be roughly between $141 and $242, depending on how many exemptions they claimed on their W4, so not enough to drastically change the difference. How does it affect the housing burden cost? All of a sudden, the housing burden drops from the untenable grip of a “severe” ~80% to what the Census would call merely “moderate” housing burden. Just like it was in 1950. Someone who is working full-time at a job that pays “minimum wage” can now live modestly at median rent levels. They would have adequate money to pay for things beyond their roof and heat — healthcare, food, clothing, and maybe even a tiny bit to save away in case of an emergency or so that they can someday buy a house or pay for their child’s tuition. I had said earlier that $15 per hour was slightly higher than it needed to be — it could be slightly lower than that and still fall within “Moderate Burden”. Making it $13.50 per hour would put it on exactly 40% Burden (dead-center in that range) with Median rents of $864. What about someone working 20 hours weekly (maybe they go to college)? What would have previously required going into substantial debt now appears to be mitigated by getting a roommate or taking on small debt, or getting some financial assistance. The main critiques I have seen of both proposals are that the market will mutate to accommodate these additional funds, and so it will return to homeostasis. Introducing State-based rent controls (or at least rent stabilization) would be one way to ameliorate that outcome. Government regulation is necessary sometimes, as much as people dislike it, because it levels the playing field when ethical considerations are not espoused by all economic actors. Child labor was cheap, even though it was ultimately bad for the kids — but since employers were unwilling to say “we cannot, on good conscience, do this, and we can’t not do it because it makes us less competitive,” the government had to regulate and prohibit it. Same thing with regulations like the “Clean Water” and “Clean Air” acts — if we cannot trust the private sector to be responsible and ethical, then the Government’s job is to step in to ensure that their fiduciary duties do not adversely affect the rest of us. Another possibility is to address the bigger issue of wealth evaporating to the upper echelons of economic strata. Bleeding that wealth back down (likely through a more progressive tax rate that includes non-income taxation, such as on dividends, and also preventing dynastic wealth through taxation on estates) to everyone else would introduce more money back into the general economy and would be a more Keynesian solution. After all, the money is there, it’s just all evaporating away from the people who are working to produce the GDP that yields those profits. At the very least, however, the Minimum Wage should be modernized to once again fulfill the purpose that Roosevelt clearly intended it to, back in the 1930s. Even merely raising it to $10 an hour would bring the Burden down to 54% from ~80%; still classified as “Severe”, but less so. $13.50 an hour would be acceptable. $15 an hour would be invigorating.